... or buy them already colored! For the Easter table centerpiece on this page, I dyed white eggs because all the surrounding colors were light, bright 'summer' colors. 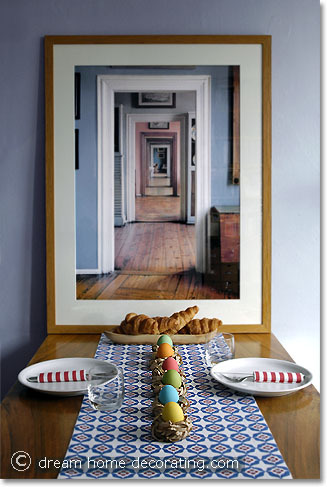 If you're decorating your Easter table in a less saturate, 'vintage' color scheme, consider using brown eggs instead. They dye to wonderfully mellow tones and work beautifully with country style Easter table settings. The detailed dyeing instructions are here. The little Easter nests are made from strands of shredded kraft paper, coiled and tied into loose knots. Detailed instructions here! The dull tan color goes beautifully with just about any other color, and it's particularly great for showing off brightly hued Easter eggs. If you don't have a paper shredder, you need a craft knife, cutting mat, and ruler to slice kraft paper into narrow strips, plus a stapler to hold each end of the paper strands together. But that's all it takes, and making the nests is incredibly easy. You can make these nests in any size. If they're larger, though, you may want to place each nest on a plate so it doesn't fall apart. I wanted to create a formal element for this informal, 'Easter picnic' table setting, so I lined the nests up in a neat row. But here's a pic of a more informal arrangement of the same Easter nests! 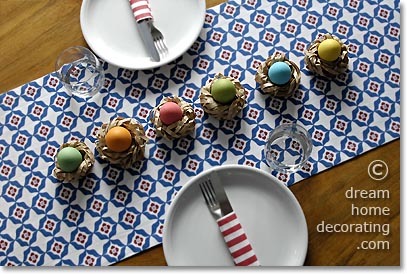 Return from Easter Eggs Centerpiece to Easter Craft Ideas. Return to the Dream Home Decorating homepage.